By 1971 Thomas D. Willhite and his wife Jane Willhite were acquainted with Werner Erhard, founder of the controversial "Est" self-improvement movement and part of the "liberal CIA" network surrounding the Esalen Institute. In 1973 Thomas and Jane founded the Personal Success Institute (PSI) Seminars, also focused on self-improvement, as well as globalization, equality among races and reducing poverty. Apparently Willhite was a close friend of Ron Rewald, the CIA asset and chairman of the Hawaii-based investment firm Bishop, Baldwin, Rewald, Dillingham and Wong (BBRDW). When Rewald was left out to dry by the Agency, Rewald planned to publicly protest, but was killed by a plane crash before he could do so. [CIA] agents [Richard "Bob"] Allen and [Angelo] Cancel, who had tried to kill Rewald in the hotel [after they found him still alive after a suicide attempt], threatened [BBRDW founder and chairman Ron] Rewald's secretaries, Sue WIlson and Jackie Vos, ordering them to leave Hawaii and never return. Their departure would prevent them from testifying about the CIA operation. As the two women later discussed their problem [while being tailed], Sue told Jackie that if she hadn't heard from her in the next thirty days to call the local police. When Jackie asked Sue if the FBI should be called, Sue responded: "They won't help us. They're all in this together. We might be able to trust the local guys. They're not part of the system." There's a big cover-up going on. They've completely disavowed any knowledge of you. You are being left out to dry, pure and simple. I'm calling a press conference for tomorrow at the ranch. I'm going to tell the media everything. Tell them this is all a CIA cover-up and that you were just following orders. Tom, you can't do that. I have an agreement with the Agency. They assured me that as long as I keep quiet, Nancy and the children will be taken care of. They will take care of me as soon as all this cools down, so don't do this. It's not necessary. They're lying to you, Ron. I assure you they are destroying every bit of evidence. They are shutting us all up, transferring others to who knows where. All the bank accounts are being emptied. Believe me, you are being abandoned and set up. You know what plausible deniability is all about. Before the press conference the following morning, Wilhite took his red aerobatics Pitt Special bi-plane for a customary morning flight. Taking off from the grass runway on his ranch, the plane climbed steeply to 1,000 feet and then suddenly plunged to the ground. The crash killed him. The aircraft had apparently been sabotaged. Wilhite's death wasn't the only one connected to BBRDW. Two lawyers were killed in Washington as they searched for evidence linking BBRDW's client, President Ferdinand Marcos of the Philippines to the CIA. PSI is a company with a dream...a dream of a more cooperative and harmonious world where people are empowered to realize a life of liberty, purpose and passion. In 1973, PSI was created to spread the personal success principles that had brought the founders Thomas Willhite, and Jane Willhite so much liberty in their lives. In 1983, Thomas Willhite died in a plane crash when his bi-plane went down at the company headquarters. Since that time his wife, Jane C. Willhite, has run the company as CEO and is responsible for its current growth and success. Immensely effective since the 1970s, PSI continues more than three decades later to chart a course of expansion for this unique educational company. Programs are held in many locations in the U.S., Canada, Japan and Indonesia with 12 PSI offices in major cities throughout North America and many more to come. Tom and Jane Willhite sat right next to Werner Erhard/Jack Rosenberg in Alexander Everett’s Mind Dynamics class in 1971. Mind Dynamics was bought by Holiday Magic owner William Penn Patrick in 1970 to complement his Leadership Dynamics course. All managers in the Holiday Magic company were required to take the Leadership and Mind Dynamics courses. William Penn Patrick (Tom Willhite’s tutor) was a mean and greedy man who ran a Federal Trade Commission indicted pyramid scheme that didn’t pay salesmen commissions and loaded up garages of unsalable cosmetics on poor unsuspecting saps. WPP physically slapped his wife Marie and his children as well as kick and punch vulnerable non self-confident Leadership Dynamics participants. WPP stole Alexander Everett’s mindful and thoughtful approaches to self help and twisted them into to a highly profitable mind-bending money machine for his minions. Werner Erhard/Jack Rosenberg and Tom and Jane Willhite learned their crafts from the Leadership/Mind Dynamics courses to create EST, Forum, Landmark Education, and PSI Seminars. Many others came from these classes to create other Large Group Awareness Trainings and Encounter Groups. The results are easy to find. 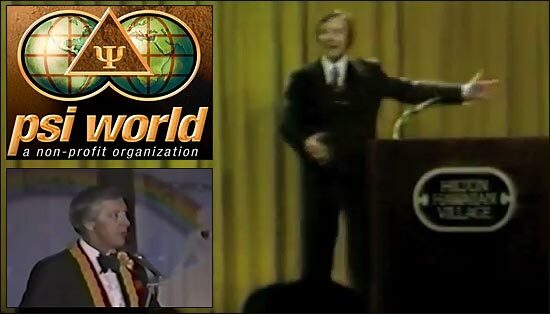 The Werner Erhard connection is very significant, because this person was part of the new age "liberal CIA" spook network surrounding the Esalen Institute - as the revelations of Jack Sarfatti have made plenty clear. "You are going to get the very best out of this. In all the years I've been in this business, I think this is the best thing I have ever seen. I am staking a reputation of the past 40 years on what PSI Seminar does. It's that good." In 2012 his widow Jane Willhite wrote the book The Dream Machine with Bob Proctor and Berny Dohrmann. Also Jack Canfield and Law of Attraction-style self-improvement gurus have taken inspiration from Thomas Willhite.